It'll be fine. You won't lose me. Short version: Explore ACDB, earn cards. Daily! Long version: We've long hard a couple of problems. 1. 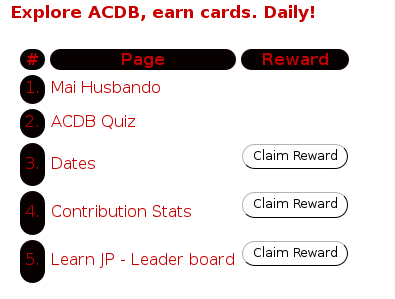 There's over 800 PHP scripts on ACDB, and I'm always adding new ones. 2. Too many of them go unused and unseen. So I figured why not take a random selection of them each day, and issue cards for visiting them. It has a few added benefits for me in that, each day I get to revisit things I created months and even years ago. A page that used to have only a few entries now has hundreds, so I update it to have a pager. A page with links to other pages, I find are not in the menu, so I add them. It's an easy and fun way for me to refresh the site, at my own pace. And should you see something you like, know that all these links can be found in the Menu, and you can use the bookmarks feature to add it to your own drop down list of link.